Francesco Marciuliano can be found on the top of the strip in the credit line. For art credit: The strips start off with Craig Macintosh handling the drawing chores, then in 2011 Craig hired Jim Keefe to assist with inking and coloring the Sunday pages. The March 31, 2013 Sunday page was where Jim was in charge of the whole package – pencils, inks, lettering and coloring. Infamous Non-bunny ear themed strip. 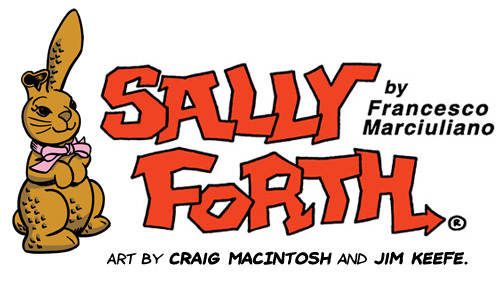 This entry was posted in Craig MacIntosh, Sally Forth and tagged Craig MacIntosh, Sally Forth. Bookmark the permalink.